The CFT is one of the most compact functional trainers from BodyCraft, great for anyone who doesn’t have too much space to spare for fitness equipment. It’s a commercial-grade strength training machine, next to the BodyCraft GXP, and offers top-quality for all of its parts. It’s not one of the most affordable units but definitely offers excellent value for the price. 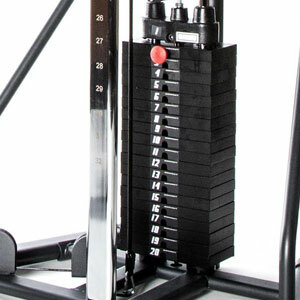 As we’ve mentioned above, the BodyCraft CFT is quite a compact, space-saving fitness machine. With the frame fully assembled, it only takes approx. 40″ x 50″ (100 x 126 cm) of space. Also, its height measures 82.5″ (210 cm), so the unit should fit even in a room with a 7′ ceiling (a tight fit, but should fit). Of course, it is recommended to leave at least two feet of clearance on each side, and at least three-four feet of clearance at the front of the unit, to be able to perform all the exercises correctly, add a bench or other addons. The lateral base bars of the machine feature large rubber stabilizers. These are non-adjustable, but if assembled properly, the unit should offer excellent stability due to its weight. This being said, the bases do not have anchor points for securing it to the floor. It is recommended, though, to place and use it on a rubberized mat. Needless to say, this home gym system features a heavy-duty construction. Its frame is made of heavy gauge, ovalized steel tubing for extra sturdiness and aesthetics. The base of the frame, the adjustable arm, and the top bar feature a corrosion-resistant and chip-resistant paint finish, black in color. The central adjustment post of the arm, as well as the guide rods of the weight stack, have a chrome plating finish. The upright adjustment post of the machine offers 32 positions for the moving arm assembly. The distance between the adjustment positions is a few inches. The highest position is at approx. 78″ (198 cm) above floor level, while the lowest position is at approx. 12″ (31 cm) above floor level. The selector of the moving element is a sleek handle which allows you to easily unlock and lock the bar into the desired position. Also, the adjustment numbers on the upright bar are laser etched so they won’t deteriorate or wear out easily like stickers. 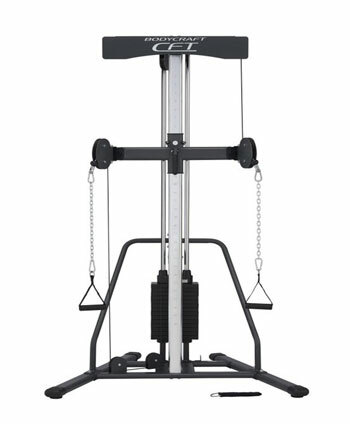 The BodyCraft CFT functional trainer is equipped with 13 fiberglass-reinforced nylon pulleys. Each pulley integrates a sealed ball bearing in order to provide a smooth operation and a long lifespan. The moving arm assembly of the machine has two pulley brackets each one with two pulleys. Each bracket can swivel 180° in order to adapt perfectly to the exercise that you perform. The machine integrates several aircraft steel cables, tested for 2,000 lbs tensile strength. They are also nylon coated to provide a smoother travel over the pulleys and to reduce wear and tear. In terms of accessories, the BodyCraft CFT functional trainer includes two D-handles which have rubberized grips for extra comfort, two extension chains, one ankle cuff, and an exercise poster which you can attach to the top plastic cover so you can consult it whenever you want. Of course, there are various other accessories available for this machine. For example, you can opt for the Power Row attachment, one of the F603 or the F320 utility benches, a functional long bar or a handle for golf swings and baseball swings. 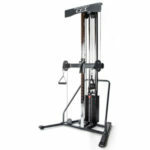 The BodyCraft CFT functional trainer is available either with a 150 lbs (68 kg) weight stack or with a 200 lbs (90.7 kg). Evidently, if you opt for the 150 lbs one, you can always upgrade to 200 lbs by just purchasing the extra plates. The weight plates are made of cast iron; they’re highly durable, they can take a lot of abuse and if the unit is used in a home gym, they can definitely last a lifetime. Just as the main adjustment bar, the weight plates have their numbers laser etched for extra durability. The machine offers a weight ratio of 4:1. In other words, with the 200 lbs stack, you will get a maximum of 50 lbs (22.6 kg) per arm. Each plate weighs 10 lbs (4.5 kg), so this results in 2.5 lbs (1.13 kg) adjustment increments per arm. 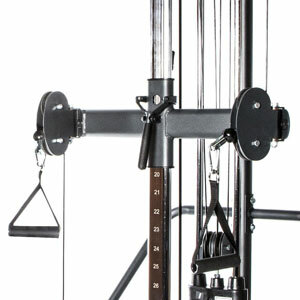 Of course, you can benefit from a 2:1 weight ratio (100 lbs of resistance) if you connect the two pulleys of the adjustment arm assembly with one of the included chains, and attach the D-handles at the middle. Along with these there still are other exercises that you can perform on this machine. For example, you can perform lat pulldowns, cable crossovers, baseball swings, golf swings, as well as fast exercises for high-intensity cardio, such as cable punches. Also, some of these exercises require accessories that are not included with the unit. For example, incline presses or horizontal presses require a bench, while baseball swings require the special sports handle. Compared to other strength training machines, such as the Inspire Fitness M3, for example, the BodyCraft CFT isn’t a highly complex machine. Therefore, even though it requires full assembly, it shouldn’t be too difficult. The included manual provides excellent step-by-step instruction and schematics, so the whole process shouldn’t take more than two hours. It is recommended, though, to be carried out by two people. Once the unit is assembled, maintenance doesn’t require much. The guide rods of the weight stack and the main adjustment bar may require a bit of lubrication from time to time. Other than this, it is recommended to periodically check the unit for loose bolts and parts. The BodyCraft CFT is a commercial-grade functional trainer featuring a compact design, a heavy-duty frame, and 32 adjustment positions for the pulley arm. It’s available either with a 150 lbs or a 200 lbs stack. It offers the possibility to perform more than 25 exercises, and due to the 4:1 weight ratio for each arm, you can also perform high-intensity cardio exercises. It’s definitely a top-quality strength training machine, great for a full-body workout.